Patellofemoral Pain Syndrome (PFPS), widely known as Runner’s Knee, remains the most common injury amongst runners. We’ve examined many aspects of it in our previous articles, today we look at ways to adapt your running gait to help PFPS. Now I’ll admit I’m a little cautious when it comes to changing people’s running gait. There are a number of reasons for this. Running style is a very individual thing – there’s no one ‘correct’ way to run. Each runner will have developed a gait that feels comfortable and efficient, it’s a gamble changing this. In clinic I’ve seen a number of injuries result from attempts to change running gait, especially switching to a forefoot strike. Reducing load on tissues when running is difficult and usually results in an increased load elsewhere. The exact relationship between running gait and injury is also a somewhat murky one, in many cases it is how much you run, rather than exactly how you run that is most relevant in developing injuries. A key concept in Runner’s knee is trying to reduce the load going through the patellofemoral joint during running and therefore reduce pain. There are a number of ways to do this, we’ll look at just 2; the easy way and the hard way! The ‘easy’ way to reduce patellofemoral load during running is to increase your step rate and reduce stride length. This probably doesn’t sound easy but it’s a lot more simple than the ‘hard’ way! Step rate and stride length are intimately linked. If you increase step rate (how many steps per minute) it’s likely stride length will reduce, so simply step more quickly but with smaller strides. All three studies follow a fairly similar method – a metronome was used to help runners increase their step rate by around 10%. This was enough to have significant effects on knee load without negatively effecting performance. You can download free metronomes on MP3 if you want to try this approach but you may need help initially to determine what your current step rate is and workout what your target should be. An easier, although less scientific approach, is to use your symptoms as a guide. If pain starts during a run see if increasing step rate and shortening your stride a little reduces your pain. Find a rate and stride that feels comfortable. I developed patellofemoral pain during my marathon training. It was actually what led me to explore the relationship between stride length and knee load. I consistently found that if I reduced my stride length and increased my step rate my knee pain would go almost immediately. With a little trial and error I was able to find a comfortable running style with no pain and completed my marathon in 3hrs 12 mins without any symptoms at all. It’s interesting to see that research has found a potential mechanism to explain my own personal experience. Picture source Heiderscheit et al. (2011) freely available online. Reduce your hip adduction and internal rotation angles during the impact phase of running. This is based on some promising research by Noehren et al. (2011). They treated 11 runners (all women hence point ‘1’ above) who they found to have excess hip adduction during their running gait. They used real time feedback and 3D gait analysis to guide these runners in altering their gait. The results were excellent and maintained 1 month later after this feedback had been gradually removed. The runners displayed a significant reduction in hip adduction and pelvic drop, a 20% decrease in average vertical loading rates and, most importantly, a large reduction in pain. This all sounds very promising, especially when you consider that, historically, treatments for patellofemoral pain have shown modest results at best. But, and there’s always a but, you need to delve into the study a little bit to find a somewhat major stumbling block. The study started with 170 participants, 85 underwent video gait analysis and only 11 had excessive hip adduction and qualified for the study. As mentioned above, all of these subjects were women. What this means is that of all the subjects available only 13% can be said to have benefitted from the intervention. What about the other 77%? And, crucially, what about the men?! Perhaps what this study demonstrates is that excess hip adduction during running gait is more common in women (which concurs with previous research) and may be correctable with gait re-training. This gait re-training appears to result in significant improvements in pain and function as well as running mechanics. Patellofemoral pain is a multifactorial problem and every individual will have a different set of key factors. This study highlights that, with careful assessment, we can identify patients that will benefit from specific interventions tailored to their needs. I’m a big fan of this approach rather than a ‘one size fits all’ recipe which doesn’t account for individual differences. There is however, another ‘but’ and another reason why I called this the ‘hard’ way… It relies on an 8 camera 3D motion analysis system. Do you have one of those going spare?! Most runners won’t have consistent access to this (the subjects had 8 training sessions). That said, they use a cue for runners to contract their gluteal muscles and attempt to run with their knees pointing straight ahead with a level pelvis. This should be manageable for many runners but may need several sessions with feedback to help change the technique. Is there another way? Recent research by Bonacci et al. (2013) found that a running barefoot reduced load on the patellofemoral joint. Barefoot running encourages a forefoot strike which may reduce PF load but increases load on the calf complex. Bonacci et al. also noted that barefoot runners had a shorter stride length, this may be a key factor in their reported reduction in knee load. Our previous articles discusses this study and the role of barefoot running in PFPS. It’s worth noting that, as ever, there are limitations in what we can conclude from research and the role of gait changes in PFPS. Further large studies on the effects of gait re-training on both long term and short term symptoms of PFPS are required. Closing thoughts: patellofemoral pain is known to be a multifactorial problem, we’ve discussed previously that there are many individual variances, including running gait. It may be that altering your gait, at least temporarily, may help symptoms. The easiest way to achieve this appears to be by increasing step rate and reducing stride length to a find a comfortable style. As PFPS is so multifactorial a ‘multimodal’ approach to management is often required. Changes in running gait may work best when used alongside strengthening the glutes and quads, improving movement control and modifying training volume and intensity. 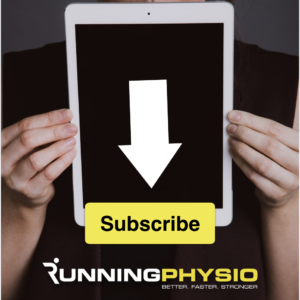 Whatever changes you make should be based on a detailed assessment from a physiotherapist – as ever on RunningPhysio if in doubt get checked out! PFPS is a large target. Shorter faster stride is a common PT running tip. Combine the two you writing an easy one size fits all answer. Dr. Irene Davis also has a fair body of evidence looking at runners (mostly females) and gait retraining. While also using a fair amount of high tech gear in her studies, many of her intervention strategies are quite useful and affordable. Great article Tom. What are your thoughts on the recent Boyer et al article in AJSM? Slick manuscript. Keep up the good work.